Manali Leh Highway is one of the roads that lead to heaven on earth called Leh – Ladakh (Srinagar – Leh Highway is the other one). It is one of those Highways in the world which offers almost everything nature has to offer to an adventure lover. Serious travelers in India and abroad do have a dream of traveling on this dangerous and beautiful Highway at least once in their lifetime. I am one of those honored souls to have experienced this journey of my life multiple times. Having said that, the journey on Manali Leh Highway could be a bit tricky to plan if you haven’t researched well enough. Almost more than 350 KMs out of 474 KMs long Manali Leh Highway, does not have any civilization and hence you would be the only soul wandering on most part of your journey here. 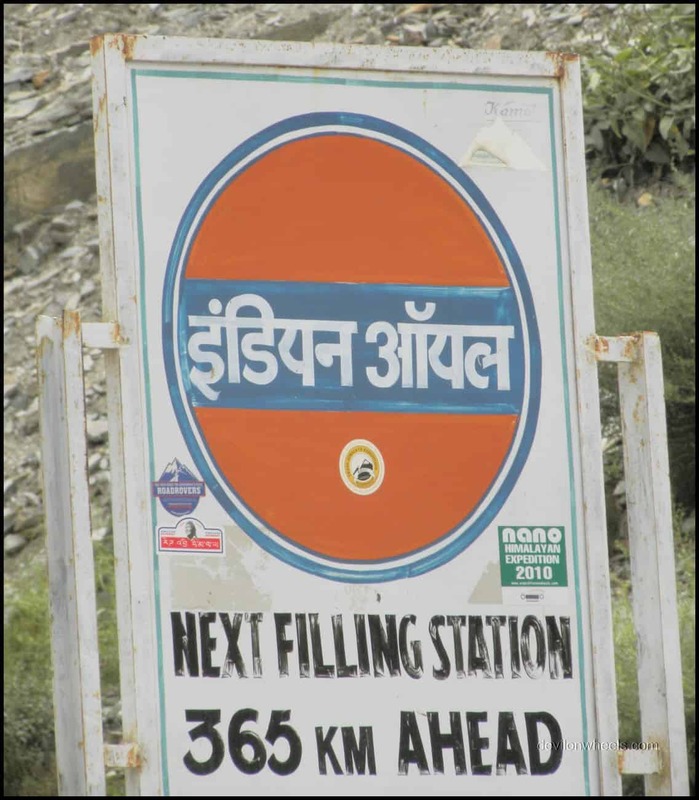 Even one cannot find fuel (petrol/diesel) for 365 KMs on Manali – Leh Highway. Therefore, adequate planning is very well required to travel on Manali – Leh Highway so as to make it a memorable experience. Should I travel to Leh Ladakh via Manali or Leh to Manali? Should I plan Manali Leh Highway in August? Can I do Manali Leh trip in a small car? Should I hire taxi from Manali for Ladakh? I hope the below information in this detailed travel guide of Manali Leh Highway will be helpful for someone planning a journey on Manali – Leh Highway. Traveling from Manali to Leh will hold you back from the enjoyment. Believe me, mostly due to AMS and its symptoms because the majority of the time you are above 4000 Mtrs of altitude which your body cannot adapt easily so quickly. But, while coming from Leh towards Manali your body will be acclimatized for the high altitudes much more than when you travel to Ladakh from Manali. If you still prefer to travel to Leh Ladakh via Manali, then you can follow the most common itinerary to travel to Ladakh from Manali. Secondly, travel from Leh to Manali will also help you halt you journey at Sarchu which is at an even distance between Manali and Leh and offers a varied amount of accommodation option. Otherwise, you will end up doing Manali – Keylong on one day and push from Keylong to Leh on the second. Sleeping at Sarchu is not recommended if you are coming from Manali unless your body has completely acclimatized to Sarchu altitude by staying in Spiti and Lahaul Valley for about 4-5 days. Hence, always try to plan a journey to Ladakh in such a manner that you enter Leh via Srinagar side and then after exploring Leh – Ladakh for few days come back via Manali – Leh Highway. You should also read: 5 Reasons to choose Srinagar – Leh Road to enter Leh over Manali – Leh Road. Usually, the opening of Rohtang Pass and Baralacha La majorly governs the travel time on Manali – Leh Highway. The average time for the opening of Rohtang Pass every year is around May and Baralacha La usually opens up close to May end. Hence, June to September is the time window when the Manali – Leh Highway is open and is considered as the only time for traveling on Manali – Leh Highway. In the early stages i.e. June, one can find huge stocks of snow en-route but the road conditions may be a challenge to drive. While in the later stages i.e. August to September, the conditions of the roads are almost perfect in shape with all the slush dried out, maintenance work almost completed on these roads by BRO but your eyes will be devoid from the snow mostly. The weather in June is always unpredictable and chances of rain are also bright. 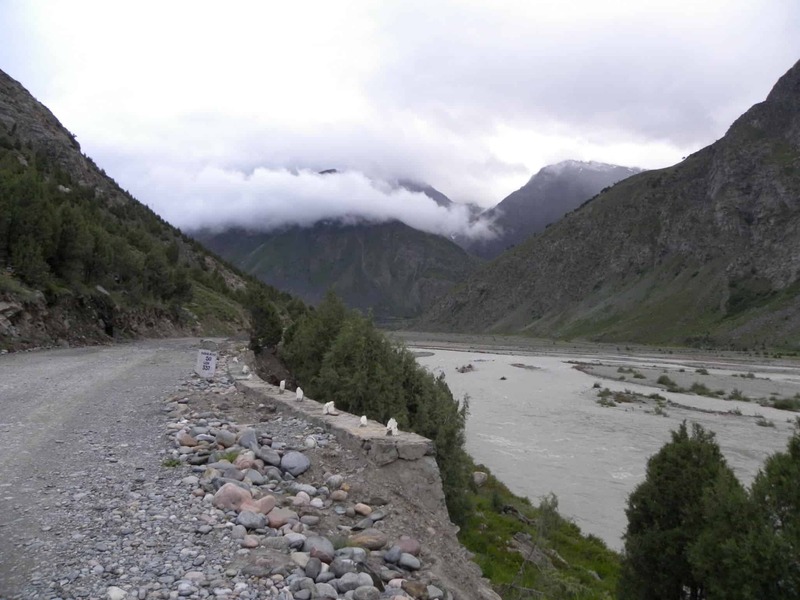 This leads to the closure of certain sections on Manali – Leh Highway due to landslides triggered by rains. However, you may be lucky in June as well to cruise this Highway in bright sunshine. June is not exactly the ideal time when one wants to be in Manali due to mad tourist influx. As the July – August comes, the Monsoon comes as well in the Northern parts of India. However, the regions on the Northern side of Rohtang Pass that is Keylong and beyond mostly remains untouched by these monsoon rains (except the year 2010 which was an exception). 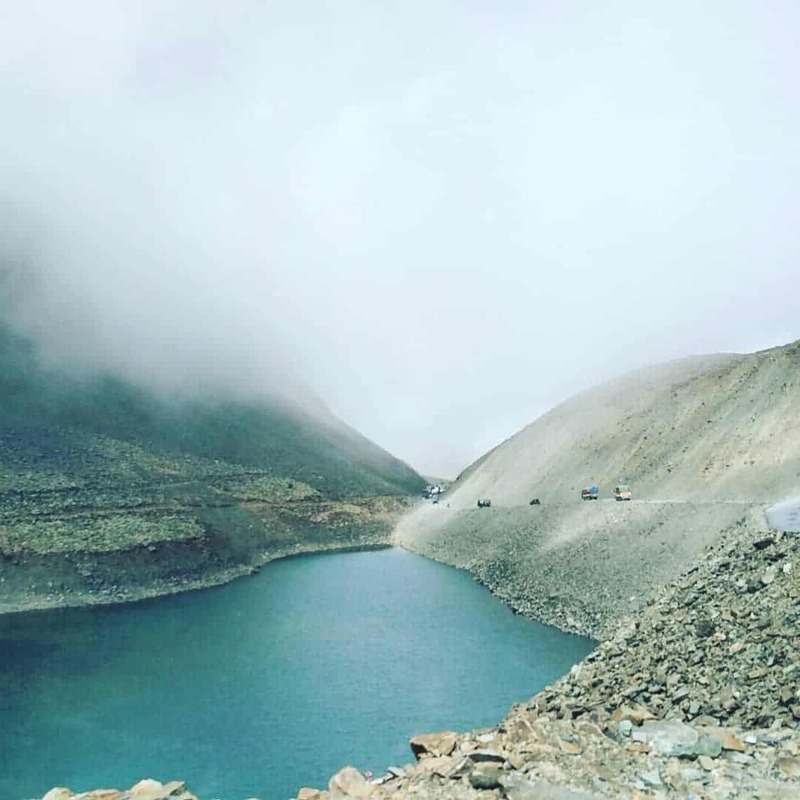 So in July-August, though you may need to cross the Southern side of Rohtang Pass in Monsoon rains that is Manali and lower hills, after especially Keylong, you are almost good to go without much trouble with these rains. Planning a trip on Manali Leh in October? June – July is also the time window when the snow melts on high passes creating almost tiny rivers or water crossings (nallas) on roads in the early stages. This is quite a challenge to dodge, especially with the vehicles having low ground clearance. Post afternoon, when the sun is burning at its best, some of these water crossings or nallas becomes so violent that they are almost impossible to cross. This may force you to halt the journey of the day in the middle of nowhere or return back to some civilized place for a night halt. The best way to overcome these water crossings or nallas, is to know the specific nallas on Manali – Leh Highway and plan to cross them as early in the morning as possible. In recent years, one of the major hurdles was water crossing or nalla just near Zingzing Bar even though bridges have been built on many of the water crossings up to 2018. Another major one was between Rohtang Pass and Sissu. 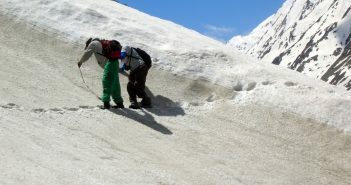 In the early stages (June), even crossing Baralacha La is a big challenge due to melting snow which creates some deep water streams on the road itself. Slush is also bound to be present on Baralcha La in the early stages of the season and is also quite a challenge to negotiate without proper skills even on SUV/MUV. This slush is generally created by the constant moving traffic which beats the snow present on the road or aside. Hence, try to cover these sections of Manali – Leh Highway in the early part of the day, when the snow melts very slowly and traffic is less. Below is the general idea of road conditions on Manali Leh Highway. Of course, they are subject to change with season, time of travel and weather conditions. However, in general, you will get the idea about road conditions from Manali to Leh road. Most people prefer to travel from Manali to Leh on bike or self-drive to Ladakh by their own car. Some people also prefer to self-drive or self-ride to Ladakh by hiring a bike or car on rental from the cities. In any case, hired car/bike or personal car/bike, idea is to live the passion of driving or riding through one of the toughest and adventurous terrains accessible in India. You can take your own or rented, car or bike to Ladakh on Manali Leh Highway but one must be careful while driving or riding through slushy roads, snow and water crossing or nallas. Also, it is always handy to learn little maintenance tasks of your vehicle prior to the start of this arduous journey in which you will be desolated majority of the time. For cars, although an SUV/MUV is good to have and a 4WD SUV will definitely help but I have seen hatchbacks (including Altos and Nano) and sedans doing good enough job on Manali – Leh Highway. Please note that when you are planning from Manali to Leh on bike, the bike registered in Manali will not be allowed for sightseeing in Ladakh. You will need to rent a bike again in Leh again for sightseeing in Ladakh. With sedans/hatchbacks or small cars on Manali Leh Highway, one must drive with extra care and caution. Also, be ready for few scratches or sacrifice some parts on your sedans/hatchbacks under-belly due to the lack of enough ground clearance which may be required in some water crossings or landslides on Manali – Leh Highway. If you are trying to travel on Manali Leh Highway in a small car or a hatchback or sedan, I will suggest planning the journey late in the season ( September) when the roads are in good shape than early season. Are you planning to hire or rent a bike from Manali? If yes, then you must go through the article on How to Hire or Rent a Bike or Motorcycle in Manali? If you traveling on Manali to Leh by car, whenever in doubt, always step out of your car, walk down the path, inspect with your foot and plan the path of exit before crossing a dangerous landslide or water crossing on your vehicle. You can also park aside and see how others are crossing the risky section to plan your route of escape. In deep water-crossings try to maintain the momentum without any half clutch measures and complete the entire stretch in one go only. If you get stuck in slush then try to back and forth your vehicles to get out of the stuck position. It is always handy to ask your fellow co-travelers to get out of the car and push the vehicle from behind in case the car is struggling to pass through the slush or water crossing stretch. These tips will certainly help you on your trip from Manali to Leh by car. Basic toolkit, screw driver set, small hammer, puncture repair kit, iron rod, two or three “2 ltr” empty bottles of pepsi / coke / limca etc to carry extra petrol or diesel (jerry cans will leak, cold drink bottles do not leak), funnel, towing rope, spare tube (must for bikes), elfy or fevi quick (2-3 sachets), jump start cables/wires, M-seal to prevent leakage etc. were among the few things which I carried along on my trip to Ladakh. All taxis (except Ladakh registration number) having taxi number or tourist permits number plates are only allowed for a drop in Leh – Ladakh. They are not allowed to be driven in Leh – Ladakh and as per the taxi union rules, only taxis with Ladakh number are allowed to roam in the Ladakh region for sightseeing. If you want to travel within Leh – Ladakh in your private taxi hired from a place other than Ladakh then in that case you need to hire a taxi with private number plate only. However, in the latter case be ready for some queries by the local taxi drivers in Ladakh or police constables on your route. You need to ensure everyone interrogating with you that the vehicles are not hired. Whenever, you need to hire a taxi always try to hire it from Manali, as the drivers of Manali will always be more skilled and more accustomed to the route or current conditions of Manali – Leh Highway. Secondly, the locals always have a majority with an advantage of local support in any hurdle you might face on the way towards Leh. To hire a taxi, go directly to Manali taxi stand and bargain hard with the local drivers only, for a drop to Leh. Do not involve any tour operator or hotel staff at any stage to save cost. The local taxi drivers will charge about Rs 1500 extra for a planned night halt on the way to Leh. The private taxi fare from Manali to Leh is close to Rs 16000 to Rs 18000 for a drop to Leh from Manali, depending on your bargaining power, tourist rush and time when you are visiting the place. June being the highest paid and September – August being the less paid. On Manali bus stand, the taxis that drop people coming from Ladakh are also available sometimes. Since the same local sightseeing rules are applied to Ladakh taxis as well in Manali, they are bound to return without any tourists from Manali side, officially. If you can catch any of those Ladakhi drivers, you might save yourself Rs 3000 to Rs 4000 for a drop to Leh from Manali. The same rule is applicable from Leh to Manali side as well and hence, if you can get hold of some Himachali driver at Leh taxi stand, you will again save about Rs 3000 to Rs 4000 on your return drop to Manali. However, you need to be a bit careful from local drivers while fixing a deal with non-local drivers. So, it is always nice if you have some references for either place upfront and call them directly to fix the deal. Secondly, it might be hard that these taxis will agree for any night halt on the way but it depends on how you gel up in the negotiations and bargaining. You can check the Leh – Ladakh taxi union rate list 2018 – 19 including the contacts of some reliable taxi drivers within Leh – Ladakh. You can get about 10-12% of discount by directly getting in touch with drivers and of course, talking in person rather on phone always help in bargaining more. Perhaps if you are traveling alone or with one or two friends, you can buy or book tickets of Manali – Leh bus service of HPTDC. This semi-deluxe bus covers the 474 Km long Manali – Leh stretch with a night halt at HPTDC Hotel Chandrabhaga, Keylong on coming from either side. The ticket costs Rs about 2900 per person (as of 2018) which includes a stay at HPTDC Hotel Chandrabhaga, Keylong and two meals i.e. dinner and breakfast at the same hotel. Earlier was also an option to buy the ticket only without hotel stay and meals for Rs 1500 but HPTDC no longer offers it. The prices mentioned here may change anytime though, so please check the HPTDC website for updated info. The overall comfort level of the bus is much better than other HRTC buses that ply on Manali – Leh Highway. You can check the updated schedule of Manali Leh bus at the HPTDC website. The tickets can be bought or booked at the HPTDC office on mall road, Manali or you may like to contact at HPTDC Office in your local town (HPTDC Contact Details). Do not book the seats at the back and confirm before booking regarding the location of the seats. In the back seats, you may have trouble when the road gets bad especially on the second day i.e. Keylong to Leh. The bus departs at 11 AM from Manali on the first day and 5 AM from Keylong on the second day to reach Leh about 7 PM. Read my detailed article on Manali to Leh Bus Service. HRTC also run a regular bus service to Leh from Manali (started in 2018) and also from Delhi and Keylong. You can book tickets for connecting buses (Manali – Keylong, and Keylong – Leh) from Manali bus depot itself or even ISBT, Delhi. You can also reach Keylong by getting a seat in numerous shared taxis that ply between Manali – Keylong every day. The HRTC buses may not be as comfortable though but comfort comes with the price. The ticket between Manali – Keylong costs about Rs 174 and then Keylong – Leh it costs about Rs 550 and Delhi to Leh costs about Rs 1380, in HRTC buses. The direct bus from Manali to Leh costs Rs 833, which was started in 2018. The bus departs at 5 AM from Keylong and reaches Leh about 7 PM. You can also buy yourself a seat in a shared taxi which runs every mid-night from Manali and reaches Leh on next evening without any night halt. In the same way, shared taxis are run from Leh to Manali as well. You need to pay about Rs 1800 to Rs 2000 per person for a drop to Leh from Manali or a drop to Manali from Leh. Of course, since it is shared with 7-8 other people plus the driver and completes the back-breaking cannonball run of Manali – Leh in 15-17 hours, you can imagine the level of comfort yourself. You can also get in touch with some travel agent or taxi union in Manali who also runs their private buses or Tempo Travelers on Manali – Leh Highway. They are also run according to dates and hence you may not find the immediate bookings for them. Some travel agencies also offer Manali to Leh road trip packages including stay and travel. Let me know in case you are interested to know about them. This option is mostly preferred by people who do not want to run the risk of acute mountain sickness (AMS) by staying at higher altitudes than Keylong or Jispa. However, on the second day, you need to leave early in the morning like by 6 AM from Keylong or Jispa to reach Leh in time. Public buses including HPTDC / HRTC halt for a night at Keylong and leave at 6 AM in the next morning, too. Personally, out of Keylong or Jispa I will always prefer to stay at Jispa if traveling on your own or privately hired vehicle. Jispa has situated right on the banks of river Bhaga and is further 20 KMs away from Keylong town. Spending the evening at this place is extremely refreshing and is far better experience than the boring Keylong town. 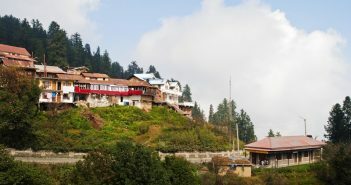 While Keylong town offers varied accommodation options, Jispa has only a few options available for a stay and hence, it is important that you pre-book them. Secondly, if you are traveling by public transport i.e. HRTC or HPTDC buses then you need to stay at Keylong only else you need to manage the travel to Jispa yourself and then fix the pickup too with the driver or conductor. Mobile phones may or may not work in Jispa. 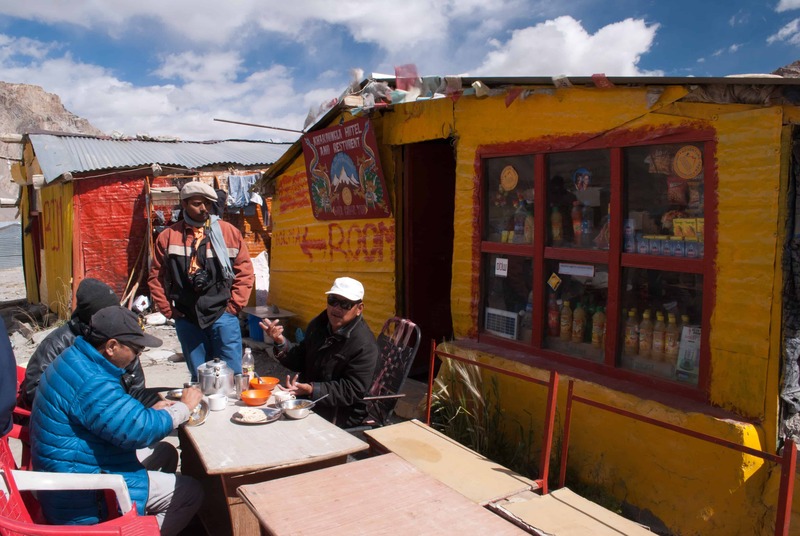 After Keylong and Jispa, you will find accommodation majorly at Sarchu and Pang only. This option is also taken by many travelers. 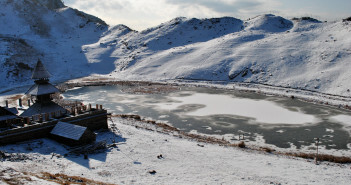 However, Sarchu and Pang being at much higher altitudes, many people suffer from headaches, vomiting or sleepless nights. Hence, if you have plans to stay either at Sarchu or Pang then it is extremely important that you stay at Solang Valley not in Manali to acclimatize your body a little bit. Solang Valley also may not help altogether though but Manali will certainly not help the cause. Both Pang and Sarchu are close to midway between Manali and Leh. So, a stay at any of these places evenly distributes the time and fatigue over a span of two days. This way it helps you better enjoy the journey on each of the two days. Again in between Sarchu and Pang, I will suggest a stay at Sarchu due to its lower altitude than Pang. Pang has lesser and cheaper options available but Sarchu has varied options including the Swiss tents with attached toilets. In the end, if you are coming from Leh, then you can stay at either Pang or Sarchu without any trouble because by then your body will be acclimatized to handle such altitudes. Don’t have a bike but planning to use Manali to Leh Bus Service? This option of completing the journey of Manali – Leh in a single day is most common among local people or people who are in a high rush and is least recommended if you want to enjoy your travel. Shared taxis are the preferred way to avail this option. Although it could be the cheapest or time saving for you, this back-breaking, cannonball run of 15-16 Hrs with least stoppages does put a heavy toll on the body as well as the mind of an average traveler. This long journey is extremely tiring and by traversing through the varied amount of altitudes ranging from 1900 Mtrs to over 5000 Mtrs in a single day, you are definitely running a risk of acute mountain sickness (AMS) or some severe headaches or disorientation en-route. This will certainly kill the joy of the journey. Keep in mind that you are most likely to hit with mountain sickness in this option. If you get away with it consider yourself extremely lucky otherwise keep in mind that any breakdown of the vehicle like puncture, engine heat down etc at some high altitude (Tanglang La, Nakee La, Lachulung La etc) with you suffering from mountain sickness may lead to very very ugly outcomes. Hence, DO NOT, I repeat DO NOT take the acclimatization factor lightly. Well, this option is nothing but the combination of other two to cover Manali – Leh Highway in three days. Definitely, this option will require more time as well as more money. This option is the best way to thoroughly enjoy the beauty of nature that is offered by Manali – Leh Highway with some worries of mountain sickness. There are plenty of places/vistas and picture taking points on Manali – Leh Highway that is worth spending this extra time and money. I suggest this option of travel or in particular overnight stay at Sarchu/Pang only when you are coming from Leh towards Manali NOT while going towards Leh from Manali side unless you are coming from Manali side after spending some nights in Spiti and Lahaul Valley. Sarchu and Pang are both above 4K altitude which requires your body to have few nights at 3K and 2K Mtrs of altitudes to acclimatize your body. 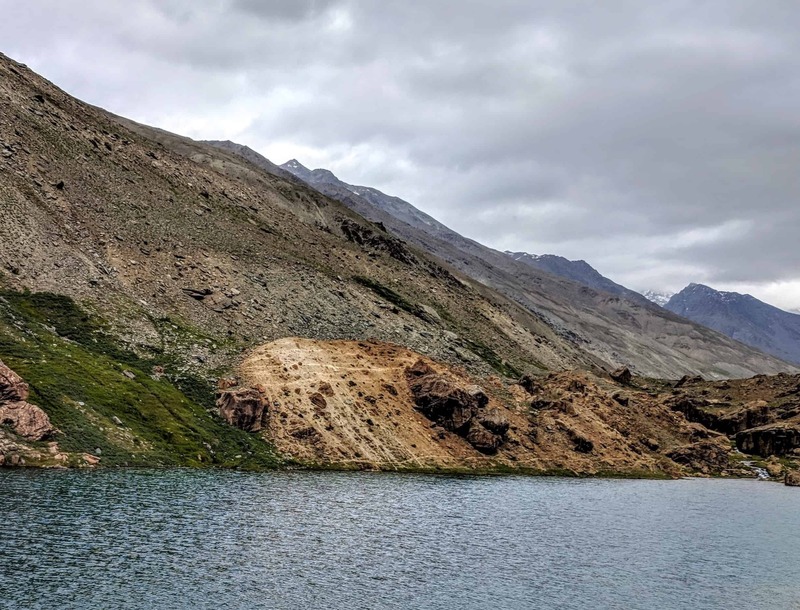 If you traveled to Leh via Srinagar side and coming from Leh after spending a few days, your body will be acclimatized better to minimize the chances of AMS at Sarchu or Pang. Very few people follow this option due to lack of time and to save money for the ultimate heaven. If these two things have no place for consideration at your grounds then I will say just go with it and you will make your journey on Manali – Leh Highway much more than a memorable experience :). I guess the comparison of night halts are already done in the first option, so opt as per your taste. Again if possible, do stay at Solang Valley not in Manali to minimize the chances or effects of mountain sickness. This option will mostly be available if you are traveling by your own vehicle. You will even have tough time bargaining with drivers at Manali taxi stand for 2-night halts unless you are ready to pay them handsomely. Its always better to know or have the list of all accommodation places on Manali – Leh Highway before you travel on it because in such unpredictable terrain you can never predict what can come to your rescue. So, having as many details as possible about the place is always favorable. The journey on Manali – Leh Highway goes through a series of high altitudes passes which are good enough to cause headaches, vomiting, disorientation and mountain sickness to the best in the business. After crossing Patseo or Deepak Tal you are bound to run this high road to Ladakh above 4000 Mtrs until you descend from Taglang La towards Rumste / Upshi. However, with little prevention and care, you can combat or minimize the effects of altitude sickness. Avoid overnight stay at Manali rather stay at Solang Valley which helps in the acclimatization whereas Manali does not. You always have an option to roam around in Manali and come back for a night sleep at some hotel in Solang Valley. This will help your body acclimatize to certain extent on the start of your journey. On Manali – Leh Highway, do stay at either Keylong or Jispa which are lower in altitude than Sarchu and Pang to minimize the effects of mountain sickness. Avoid sleeping at high altitudes. What will be the cost of Manali Leh Highway road trip? Usually, Manali to Leh road trip cost should come around Rs 3500 if you plan to travel on HPTDC Manali to Leh bus service. Traveling HRTC Manali to Leh bus in a single day should not cost you more than Rs 1000, if you are on a budget. What is the status of Manali Leh Highway 2018? You can track Manali Leh Highway status on my blog. Every year I start a dedicated thread to track the Manali Leh Road status and post regular updates. As of today (November 2018), Manali Leh Highway is closed due to heavy snowfall. What is the Manali Leh Highway opening date 2018? In 2018, Manali Leh Highway was opened on 13th May 2018. After many years, in 2018, Manali Leh Highway was opened by mid of May. Usually, Manali Leh Highway is opened in the last week of May or first week of June, officially. What are the road conditions on Manali Leh Highway? As of 2018, the road conditions on Manali Leh Highway has been improved considerably over the last few years. Most of the water crossings now have been covered with bridges. The conditions on Rohtang Pass has been improved a lot, many metalled road sections including Pang to Taglang La via More Plains. People are doing Leh to Keylong in a single day at a comfort pace now a days. After Manali town, there is only one Petrol Pump at Tandi on entire Manali – Leh Highway before Upshi / Karu. DO NOT forget to get the tank full fuel at this petrol pump, even if you had it completely filled at Manali. The more you have, the better it will be for you. Do carry enough cash money with you as the ATM is available only in Keylong and Manali town. If you have no plans to stay at Keylong then do not forget to withdraw cash from Manali town. After Keylong, you will get hold of an ATM only at Leh town. Mobile Connectivity In our case, the mobile signal of Airtel worked till Keylong only and then faded rapidly. The signals were restored after crossing Upshi for Airtel. Of course, BSNL has more coverage and better connectivity within this range than any other operator. SMS does work fine for both BSNL and Airtel. Vodafone did not work for us at all after crossing Marhi and not even in Leh -Ladakh. Packet data also works upto Keylong and in Leh packet data is available only with BSNL edge. Prepaid connections do not work in Leh – Ladakh. In the end, if you have been to Manali – Leh Highway then please share your valuable thoughts or suggestions which can make the above information more concrete and useful for someone planning to cover Manali – Leh Highway. Your comments and inputs are most welcome. I hope this travel guide will help you make a wonderful trip to this dangerous yet beautiful roads of the world. If you know your friends or family are planning a trip to Manali Leh Highway, do share this article with them to help them make a memorable trip on Manali – Leh road. We are 3 people, planning trip from Pune to Ladakh via Delhi-Manali-Leh-Srinagar for 9-10 days. 1st july : Travelling from Manali to Sarchu(overnight stay) – should we hire a private car or prefer a bus? 8th July : Local sightseeing at Srinagar and fly back to Pune. Please provide your guidance on the plan. We are about 6 persons for the first time planning for Manali-Leh in early august we have only 7 days in Hand we want to go by bike by rental can u please provide me best iternary it will be very useful for us. I’m planning for this trip in July or August 2018, so is it a right time to go and where can I get Bikes for rent in cheap price? Avoid August, better go in July Sujit. Thanks Dheeraj. Any particular reason to avoid August? may be because of the rain?… I want to go in sunny time. As I have checked previous years weather forecast and it suggested July onwards weather will be sunny. Sujit August is peak monsoon in North INdia. There will be lot of challenges in terms of road blocks and landslides in the lower hill. If you plan to fly to Leh directly, then may be yes, itis fine. Hi Dheeraj, pl let me know if the leh-manali highway would be open in late October. Also, last September I had travelled through this route and stayed on my first night at Tso Kar. There are some decent accommodations there. Next day I was in manali by 4 pm. For some reason I can’t see a mention of tsokar in your blog. Any specific reasons for the same. Thanks. Very informative post! I have a question. Is last half of September is good time to travel Leh Ladakh Srinagar? Yes Ashok, though the night gets a bit cold but second half of September is my favourite time to travel Leh – Ladakh because of beautiful colors and less crowd. Thanks dear friend. I saw in YouTube the road somewhere is very risky. We want to avoid that but still want to visit leh, Ladakh, lake, sreenagar, pegelgam etc. Would you please make a plan for us from your experience the best road root avoiding the most risky roads? 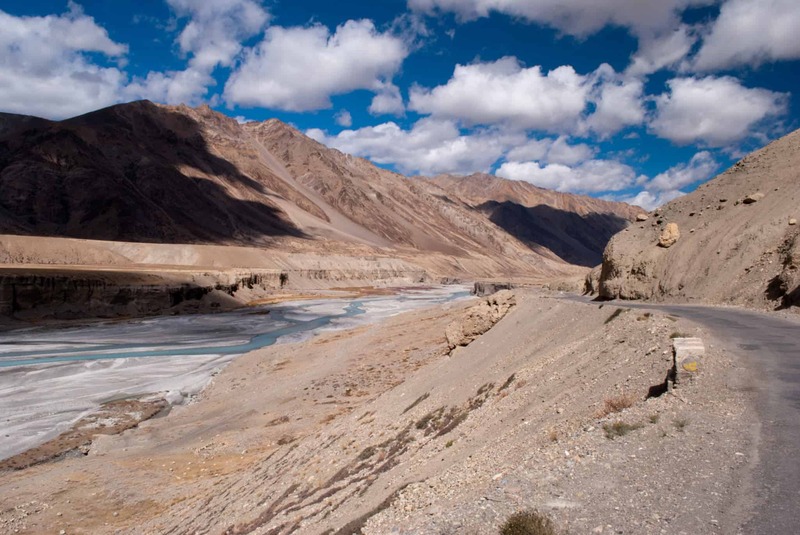 Well, the roads are risky for sure and there is no road in Leh – Ladakh where risk can be avoided. So, in case you have to make a trip to Leh – LAdakh you have to take risk which is always there with any kind of adventure. You can check a very balanced and most common itinerary for Leh – Ladakh followed by many travellers including me at the link here for 13-14 days: Most Common Itinerary for Leh – Ladakh. Your blogs on all topics were very informative, Thanks for the same. We 2 couples are planning to do Leh-Ladakh between 20, Jul to 1, Aug and initial plan was to travel by road from Manali to Leh and then fly out of Leh. (Initially wanted to fly till Srinagar and then travel by road till Manali by owing to the ever changing situations in Srinagar doesnt want take risk as travelling with family). 1. But now after reading several blogs of your confused whether to change my plan to Fly into Leh and then travel by road to Manali. 2. If I chose to travel by road while coming back will I be able to avoid reaching back to Leh from Tsomoriri and directly head to Saarchu and next day to Manali. 3. We want to hire a RE for a day or 2 in Leh and cover any of the routes from your most-common-itinerary-for-leh-ladakh, please suggest which would be good for the same as although we 2 are very good Riders dont want to take much riskier route accompanied by our partners. 4. We wanted to ride to Kargil and stay there for the night and next day to be back in Leh, please suggest will it be feasible to cover this route by bike and cover the places en-route too like Pathar Saheb, Zanskar – Indus Sangam, Dras War Memorial, Magnetic Hill etc. 1. I will suggest that you better skip the situation in Kashmir as in doubt, it is always best to play safe than sorry or being worried all the time. Max you can do is make a two day trip to Kargil – Drass and come back to Leh to fly out from there only. 3. Yes, sure you can rent the bikes from Leh and move around Leh where roads and connectivity are present. Need your suggestion as I am getting conflicting opinions . Is it possible to do Tso Moriri- Manali in one day looking at the road conditions . I am travelling in an SUV. We travel next month . Possible = Yes, Hectic = Very Hectic. 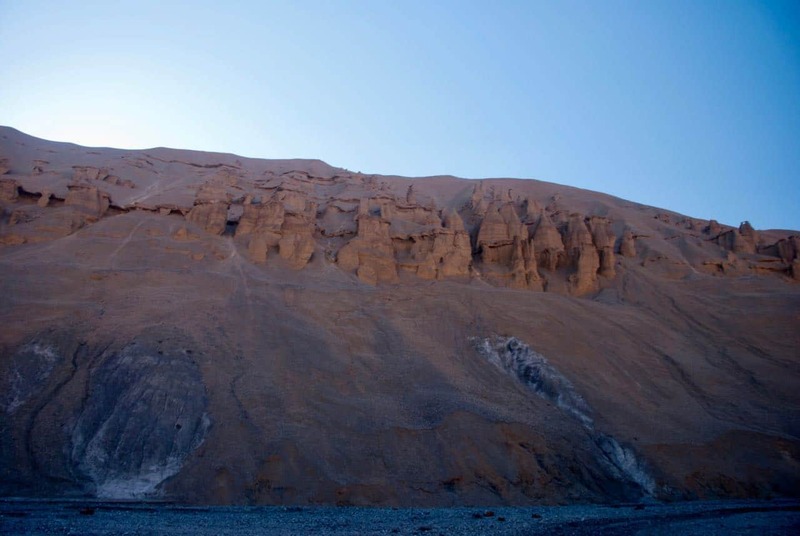 It takes about 12 Hrs to reach Keylong from Tso Moriri on an average with very short breaks. Then Keylong to Manali is another 4.5-5 Hrs with very short breaks. 1. I wanted to ask how many major water crossings are there in the way and their location, so that I could plan accordingly? 2. Considering the recent rains in Manali regions, till what point i will experience the rains in between Manali to Leh? I mean from where the rain shadow region starts? 3. Approximately how much food and accommodation would cost for 2 people (14 days trip)? Guess I just replied to your other comment. Yes, 12 days is a good time to visit Ladakh. You can check a very balanced and most common itinerary for Leh – Ladakh followed by many travellers including me at the link here for 13-14 days: Most Common Itinerary for Leh – Ladakh. First of all, thank you so much for this detailed blog. This single post is enough for all the information. Me and my one friend is planning to travel by Bike to Leh via Manali -Leh highway (MANALI – halt at JISPA – LEH ), we are planning to leave Manali on 8th July, will that be good time to travel ? Shall we expect some snow en route to Leh ? And as I read in your post, shall we expect road river(snow melt) at that time? We are planning to go by our own , is it a good idea or we should go with some group/organizer ?what challenges we may face if we go by our own ? Also,it would be very grateful of you if you could share number of some good bike rental in Manali. 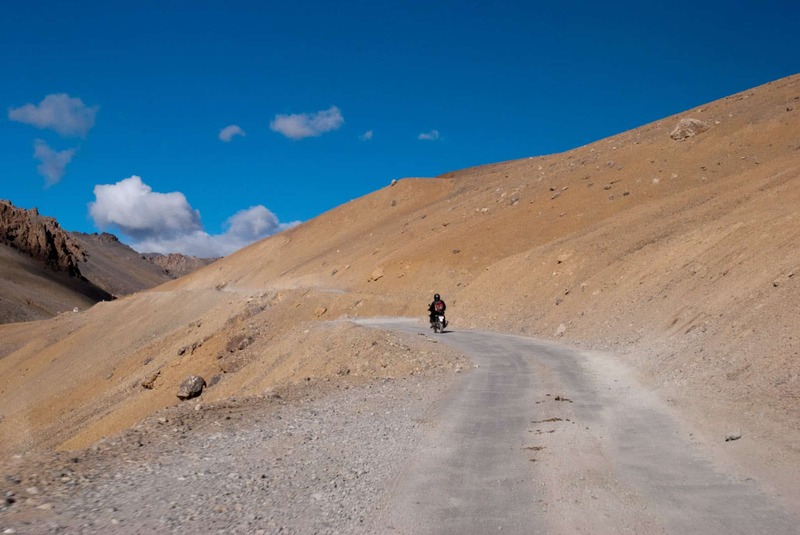 Yes Ankur, early July is good time to travel to Ladakh and Manali – Leh Highway. There will be water crossings for sure in July as well but well, that’s where adventure lies. Leave early in the day so that water is less. We are 3 people planning our leh trip from 10 June. We have around 14 days. We are planning to go with Fiat Linea (this one is not so great with ground clearance). We will be taking the Srinagar route to reach leh. And then would like to return through Leh-manali route(mostly 20 to 22 June). 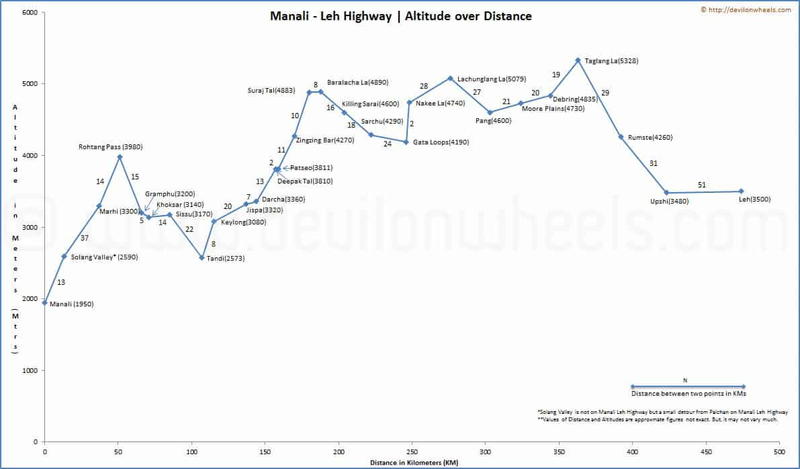 My question is – Is it impossible to do Leh-Manali in June month with a low GC Sedan car? I read that road conditions are improved from past few years. Please tell me that should we attempt the Leh-Manali for coming back with Fiat Linea or not? or we should just take the Srinagar route to come back? Also Can we do Leh – Nubra – Leh AND Leh – Pangong – Leh with Linea at this period of time? We have no plans to do the direct Nubra-Pangong route. More or less you should be good with most of the route. I will not stay the car will not struggle but still you should be able to make it with careful and cautious driving. For hatchback/sedan taking on Manali – Leh Highway Or Spiti Valley via Manali Or Ladakh, please refer the link: FAQ | Can I do Leh – Ladakh / Spiti / Manali – Leh trip in Hatchback or Sedan? for more details. Comprehensive post. I am planning a trip in Mid July ie Manali to Leh and back in an SUV . Dates are leave Manali on 13th and reach Leh on 14th with a halt in Jispa for the night . Will rest in Leh for a day and apply for ILP and take off from Leh on 15th . Cover Nubra – Turtuk (2 days) – Pangong Tso night halt – Hanle night halt – Tso Moriri a night or 2 and back to Manali on 20th /21st. Is this doable or pushing it ? Your suggestions please . Also can you advice on opening of Rohtang pass? Nikheel, the plan looks doable and I believe you have days to adjust in case there is a need. Go with it and take a call once you reach Leh. You have to ensure that you carry enough fuel from Leh to do about 950 KMs without fuel pump. Manali – Leh Highway is expected to open by 25th May. 5 KMs of road is left to be cleared from Baralacha La Pass. Further to my post below. Need some info on Rohtang pass permit and ILP . We reach Manali late afternoon. How long do you think should it take me to procure the Rohtang pass permit? Since I do not want to waste much time in Manali, some heads up on how to expedite procurement of pass will be a big help. Also some similar info on ILP from Leh. You have to take the permit in 2 days advance from the online website. Permits are vanishing in just 12 minutes, you make sure you hook on to it by 12.00 with fast internet connection. 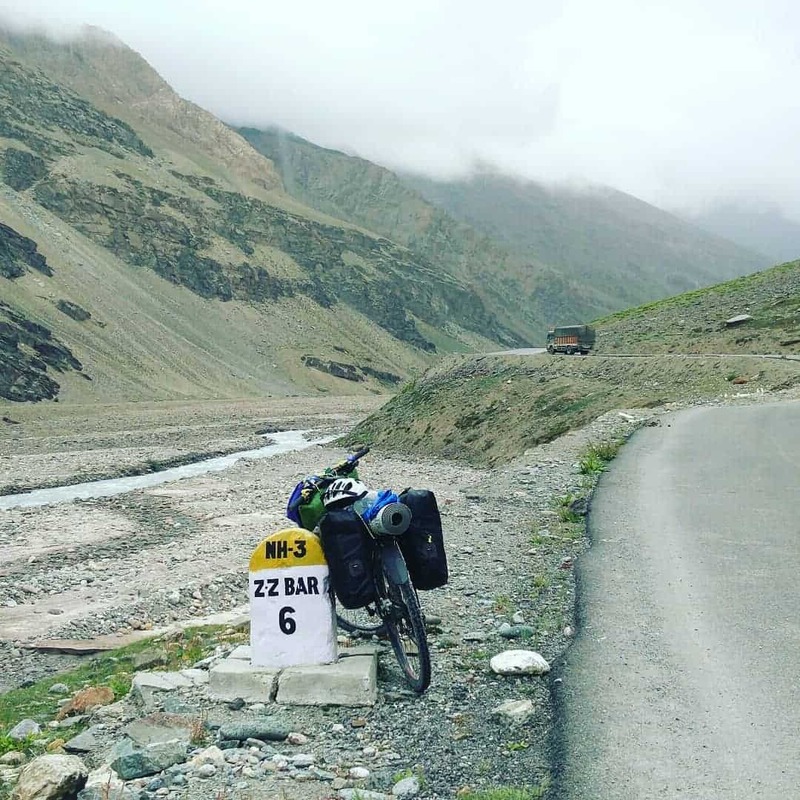 Hi dheeraj…Are there tour operators who offer bike trip from leh to manali….I find few operators providing from.manali to leh.but could not find bike trips from leh to manali. .
What about nature’s call during the 475 km journey on manali – leh highway. Is it possible if we plan the trip with tents? You can plan the trip with tents. Mostly it will be wide open nature for its call 🙂 , rest you will be staying either at Jispa or Keylong which will not make it 474 KMs long. We are 5 ppl ( 3 M + 2 F ) , planning a maiden for a Leh- ladakh trip coming June- July -17. As everyone can’t get the desired 2 weeks off so we have to curb our plan for 9 days. Here is the overview of itinerary. FYI everything is in planning stage as of yet. 23rd June – Leaving from Delhi to Manali. 24th June- Reaching Manali by 11 am tentatively . Leaving to Leh – Ladakh, Overnight stay at Jispa. Is the above schedule is good & sounds doable? If there is anything which needs to be taken care of or we are missing, please suggest. Just wanted to make sure that in process of seeing everything we should not miss the real fun and beauty of the place. Please provide your guidance on same. The plan sounds doable to me. You must take care of Acute Mountain Sickness and Importance of Acclimatization. Rest looks at least doable. I will recommend to skip Tso Moriri for some other time and dont over burn your bodies with fatigue. We are back with our memorable LEH trip. Thanks to you & DOW for all the vital information. P.S: We could not make to Tso Pangong from Nubra as the direct route via Shyok was closed. Once we reach Hunder from Leh while visiting Khardung La and Dikskit so shall we do night stay at Hunder or come back to Leh in same hotel ? It is better to halt for a night at Hunder to ease out the journey otherwise it will be tiring. Please add more days to your plan. i and my wife are going for Manali to leh in 3rd week of august for 7-8 days trip, we will go on Bike from Manali but as i will be riding bike and my wife will be sitting at back, We will take 2 bags with us so what you suggest for carrying bags in most convenient way. Are you experienced with long rides and your wife too? Also, 8 days you are saying from Manali? Best is to have Ladakh carrier installed on the bike. Planning to visit Leh Laddakh in May end or June 1st week. Is Leh Manali route open by that time ! Some apprehensions also – because of 5 and 7 yr old kid with us. what medical facilities are available on route! 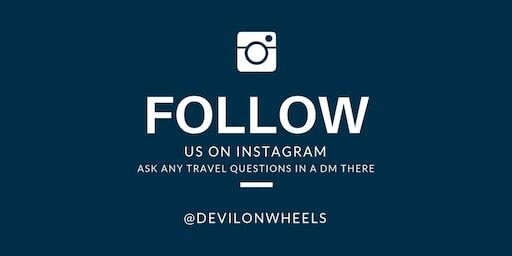 what are your inputs -if we reach directly to leh by flight. Manali – Leh may not open by that time of the year. It is not recommended to travel that early on Manali – Leh Highway with kids as road closure are pretty common during that time. Have planned for Leh by road from Chandigarh to leh via Srinagar and then back to Chandigarh via manali. can you please help us to know where to take proper stops for the above trip. and as well we will be traveling from 2 Sep to 10 Sep is this enough time for this trip ? Hi, loved the detailing in your blog.. i m planning to travel to Leh on the 10th of July from Manali.. is it advisable to visit Tso Moriri on our way to Leh from Manali?? Or should we visit it once we have reached Leh? Thank you. Not at all advisable to visit tso Moriri from Manali side. You should visit it in the last after Nubra, Pangong tso and then while coming back to Manali from Leh. Hi. We have already booked our flight tickets based on a travel agent’s recommendation (and I am cursing myself for the plan). The route is Manali – Leh – Srinagar exactly the opp of what you have recommended & also, we are planning to go by bike. Can you pls suggest a suitable plan or recommend training such that AMS issue doesn’t come up? And also, such that we reach Leh within 2 days? You should read about AMS and acclimatization including the tips to combat AMS at the link: Acute Mountain Sickness and Importance of Acclimatization. The article details out all the necessary things you need to know to go over with your journey over Manali to Leh. Even if the trip is planned by tour operator avoid staying at Sarchu while going to Leh even in case it means spending a bit more money in cancellation and all. Ok, thank you for the inputs! Am planning to ride leh from Bangalore in this April last week or first week of May…Will my plan works out considering about 3-4 weeks time? The roads from Manali to Leh will open by second week of June and hence, in April you cannot make a road trip to Ladakh. I am planning to go from Manali to Leh on 11th of June. Can you please let us know if by that time the roads will open or do I need to change my plans. I have booked my Hotels. Samya, Manali – Leh road will be open by that time of the year. i’m planning manali – leh road trip and in the month of July. My travel dates are 1st July to 12th July. So, my question is can we travel in the month of July. or else, which is the best month to visit by road. And, 12 days would be sufficient for this trip? First half of July is a good time to travel Ladakh, 12 days is also a good time period. You can check a very balanced and most common itinerary for Leh – Ladakh followed by many travellers including me at the link here for 13-14 days: Most Common Itinerary for Leh – Ladakh. Hi, I wanted your advice on my trip which we are planning this 1 July to 9 July 2017 with a group of 6 age from 21 to 35 years. 2 people have hypertension problem among them. I wanted to know will it be safe to travel at this height. We are planning Mumbai -chandigarh flight,chandigarh -manali bus, manali -leh rent a vehicle. Please can you guide on where to stay and how to plan the trip in these many days. Can you also guide whether we should pre book the vehicle or go to manali and then look into it? Thanks in advance. I would be interested in some feedback on my plan below please. Well, plan looks OK but if you will do it from the other side, it will make more sense. I mean enter from Srinagar side and exit from Manali side. Also, It will be much better that you skip the Shimla as it is nothing but concrete jungle in comparison to what you will see in rest of the journey. Use that day to make a day trip to Khardung La pass and use your contingency day to rest in Leh after reaching from Kargil. Times, don’t go by what you have mentioned it will take more what you have mentioned there. Your article on Manali Leh highway is thorough and answers all the questions. Too bad it is not open in March – we were planning to go to Keylong. 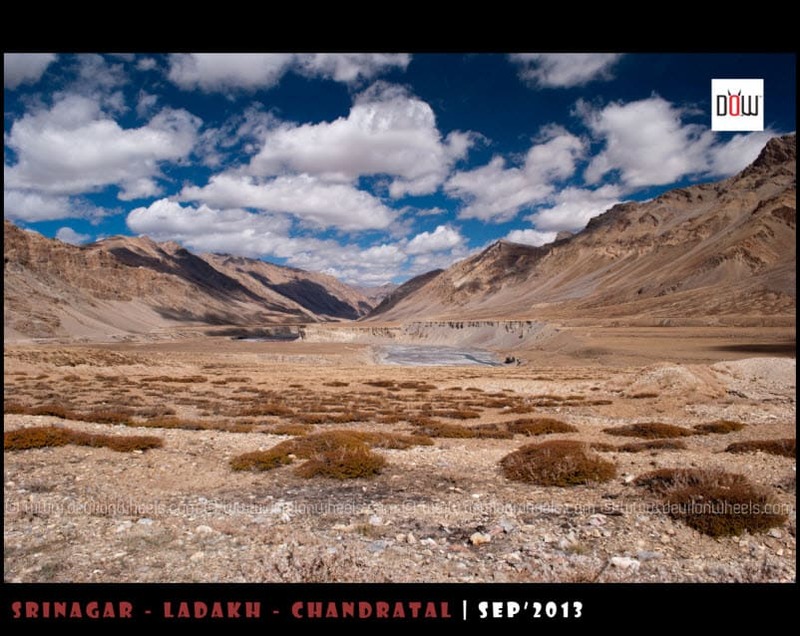 I have a plan to visit Ladakh by this year September. Want to hire exclusive Xylo for the entire tour. What should be the cost for Car [including cost for driver, inter state toll / permit etc]. You can usually get about 10-15% discount on these taxi rates after getting in touch with the driver directly. Thank you for your reply. Please let me know, if I need any special permit to travel through the below route. I am Indian citizen and will carry my photo identity card [adhar & passport] with me. Tell me if anything more is required. Bhaskar, in case you are traveling by road in your own car from Manali side, then well you need permit but I see you flying out of Leh so assuming you are traveling by taxi or other means, you will not need any permits. We are planning a family trip to by our own SUV to Delhi-Manali-Leh and back by the same route between 20 April to 03 May 17. We are parents to 16 and 20 years old kids. Also, our 2 years old PUG would be accompanying us. Kindly suggest us the itinerary. we are planning a 15 day trip from delhi-rampur bushahr-kaza-zingzing-leh-kargil-srinagar-patnitop-ludhiana-delhi in august this year. Mode of transport in bikes. 1. possibility of doing kaza to zing zing in 10-12 hours ? 2. can we find places to stay at zing zing ?? 3. possibility of doing zing zing to leh in 10-12 hours ? let me know your email address, can share the detailed itinerary as well. 3. Jispa to Leh can be done in 12 hrs. Thanks for the quick input Dheeraj. Ok, another quick question. How about rampur bushahr to kaza, looks good on paper in 10-12 hours with stops but what does your experience say?? Srijan, for sure Kaza to Rampur is a long and tiring ride/drive owing to the bad roads and you will just be rushing. With stops it will be 12+ hrs of drive only. If you say possible, I will say yes but for sure tiring. Hey Dheeraj, thank you for oyur valuable insights on the manali-leh road trip. Me and my husband have booked the tickets from mumbai to leh from 27th may – 2nd june. Although we have booked our flight tickets from mumbai to leh. But we are of the opinion of travelling from Leh to Manali by road. By halting at Sarchu. Could you please help me with deatils of how to take this trip from Leh to Manali to Delhi By Road. It would be of great help if you could provide me the some contact details for taxis or buses(mode of public transport). Unfortunately, you do not have enough time to make Ladakh trip as well as do Manali – Leh journey. With just 6 days in hand, two days will be just for acclimatization and rest in Leh when you land by flight. Then you should be doing sightseeing as well in Ladakh. 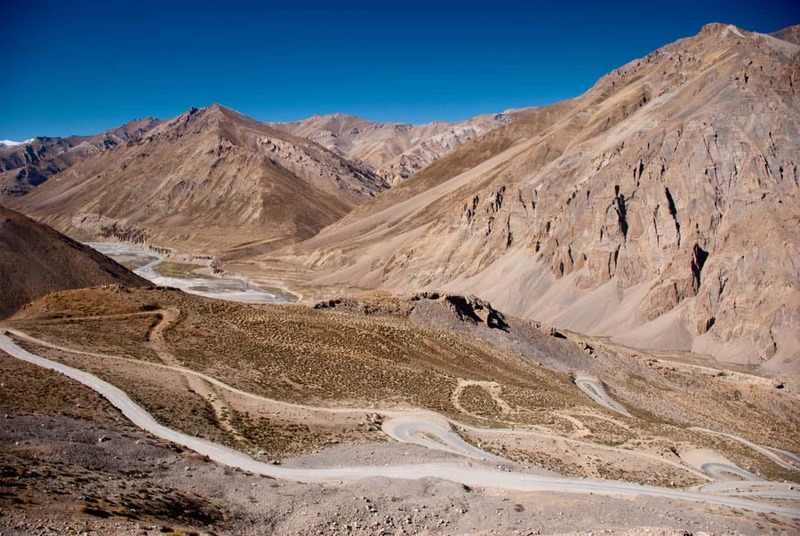 Leh to Chandigarh via MAnali – Leh Highway will take about 3 days of road journey, so you will not have enough days for sightseeing in Ladakh in such a case. Also, Manali – Leh Highway opens by last week of May and first week of June, so it is touch and go with respect to your dates as well. We have come up with the itinerary based on your inputs. We are 9 ppl with 2 kids (aged 3yrs and 2.5yrs) travelling from Srinagar to Leh to Manali to Chandigarh in the month of May. We will reach Srinagar airport around 3pm. Please do let us know if this is feasible. Ashok, I will highly not recommend taking Manali – Leh Highway that time of the year with kids and family. More or less it will be closed but even if it is open, DO NOT take this trip. Also, considering kids and family and large group, your plan is too hectic nad it will be very taxing on them. The journey is not a leisure journey, so please consider before making such a trip. Could you shed some light on how likely is it that my bike’s tyres would get punctured or fuel run out cuz these are the scariest scenarios for me and I want to clear my head around these issues before planing for rest of the things. PS – I would def plan to keep extra fuel but want to know if i tank up at manali would my fuel run out before tandi. Vaibhav, puncture is the main issue and you must plan for it. You must carry foam based solutions with you which can buy you time and help in not being stuck in the middle of no where. This blog is really informative for us. I am from Dhaka, Bangladesh. We are planning a tour from manali to leh to Srinagar in September 2017. But I m worried about the situation of kashmir. Is there foreigners are allowed at this time? Please ensure me about it. Best wishes for your trip Rutvi, feel free to post any queries you have. Now coming to point we are planning to go to leh from delhi next year june end 2017 what we are planning that we start one hour early like 11.00 in the night and reach manali by 11.00 in the morning since we need waste any time in photos and selfies as it has already been done this year and than we continue till keylong before 5 evening on day 1 , I know it will be hectic but we can save 1 day from our 7 day trip than on day 2 keylong to leh starting early in morning 5.00 am reach leh by evening adjust there and local sighseeing on day 3 than day 4 and day 5 your recommendations like some famous lake I dont remember the name than back on day 6 reach keylong night stay and than day 7 keylong to manali to delhi .. now u guide me how much is this feasable and if take 3 days while going than we get only 2 days in leh so please guide us and we have 3 driver all who have travelled and driven a lot..
hello, i am about be the weirdest person on the planet please bear me. i wanna go for a manali-leh walk trip nor bike nor bus or anything but i am not able to plan properly sometimes it’s the issue of food and sometimes it’s about the altitude sickness if not i occurred to the biggest problem for this trip is WATER I’ll be walking for around 500km (with breaks in the middle wherever i get accommodation and pitching tents by myself) if anyone can give me some suggestions, please do help me if you’ve got a idea! Aprameya, dont worry people have asked this to me many times. Now let’s work out few things. How many days do you have in hand, if doing it from Leh to Manali side, is it OK for you? Which month are you planning it? I have plenty of time, so it doesn’t matter, and yes it doesn’t matter Manali to leh or vice versa it’s going to be the same! Any month but ASAP…! Then spend few weeks in Leh and sightseeing in Leh living in high altitude villages for few nights and start your journey from Tso Moriri to Tso Kar to Debring to Pang to Sarchu to Bharatpur to Zingzingbar to Darcha to Keylong – Manali. The moment you reach Darcha, you are out of trouble. You cannot sleep at any high altitude pass and hence you have to go down to base of the pass. Somewhere in the altitude of 4000-4500 shall be fine after you have spent few nights at Tso Moriri lake for acclimatization at that altitude. Have you ever done any high altitude trek before? If not, start by some short high altitude treks gradually and see how your body reacts. Then make a call of this months of travel. Only months possible are July – August – September. * Please carry sufficient warm clothes/thermals. Thank you Anoop for the updates. I have posted them in the Manali – Leh status thread. Awesome Blog , got so much of information about leh manali journey. Thats what i am looking for. Its not easy to plan a trip like this but after seeing the post i got aware of the things to keep in mind while travelling via manali leh route. First of all, thank you for all the valuable information shared here. 19 September: monasteries around Leh: Shey, Thiksey, Hemis, etc. 1. Would you change anything to this schedule? 2. Do you recommend any particular driver for these days (except 16th of September), or we can arrange locally at the hotel? 3. If we find a driver, can he arrange the permits on the first day? (16th of September), so we can start traveling the next day, or we have to arrange them ourselves? 2. If you have a group you can get in touch with any driver but in case you planning alone or couple then it is better to rely on shared taxis to thse places on the spot. Hmm, it will be difficult like 12+ Hrs a day each and then arduous journey over Manali – Leh Highway. So, it is very tight schedule I will say. Hi Dheeraj, Its me again. Here are the details, which might help you to give us better planning. We will reach Delhi on 10th Sept @ 3AM and need to be back to Delhi by 21st 11AM to catch a flight back to blore and we are planning to take flight from leh-Delh on 21st morning,if time is not feasible. 1.We are thinking of taking a cab/taxi to manali from Delhi airport @ 4AM, do we get a cab from Delhi airport to manali without any fuss and how much would it cost and also what would be the journey time? 2.Major concern is taking a cab from Manali to Leh along with the Rothang pass permit, we have no idea whom to contact regarding the permit and afraid we might get ripped off. We have to take care of cab/taxi booking and permit in the manali on the 10th evening/night only, so that we can leave for Jispa in the early morning. So your inputs are very much needed here. 3. is it possible to visit Tso Morori while on the way to Leh? -We are thinking of covering Kargil,Magnetic hills and other near by places to kargil, which we would have visited if we had come from srinagar side. We will be going by rented Bikes . So we need you to include this in the itinerary. So can you please consider all this and give us a Itinerary. 1. No you will need to pre-arrange a taxi and could cost you around 12-14K. Manali – Delhi takes about 14 Hrs. With just 5 days not sure it makes sense to make a Ladakh trip. Leaving from manali on ¹st aug. Anyone interested can join. Anyone travelling on 12th/13th august? hey m Mayank here, m traveling whr r u frm and how many ppl r with u?? ss…me and my frnd are travelling from 13th august from manali to srinagar via leh.10 days..
we will be reaching leh by 11th aug.
our trip is for 10 days and you may contact me on this no. 9166285328/ 9982241199. Best wishes for the trip Suvesh, glad you liked the info. on the DoW Blog. Awesome blog man. I am planning to travel to Ladakh from Manali on 17 July. Many articles & blogs say that travelling on the manali – leh road gets quite tricky during July. Would you recommend traveling on the manali leh road around 17-19 July ? Would it be very risky because of the monsoon ? Also are you aware whether if its possible to rent a self drive car from Manali, which can be left at Ladakh , as we want to come back to delhi via plane. Most of the sites I found online, offer taxis from manali to leh, but not self drive cars. I am also leaving on 16th from manali to Leh. Please call me on 9953646006 so that we can coordinate.